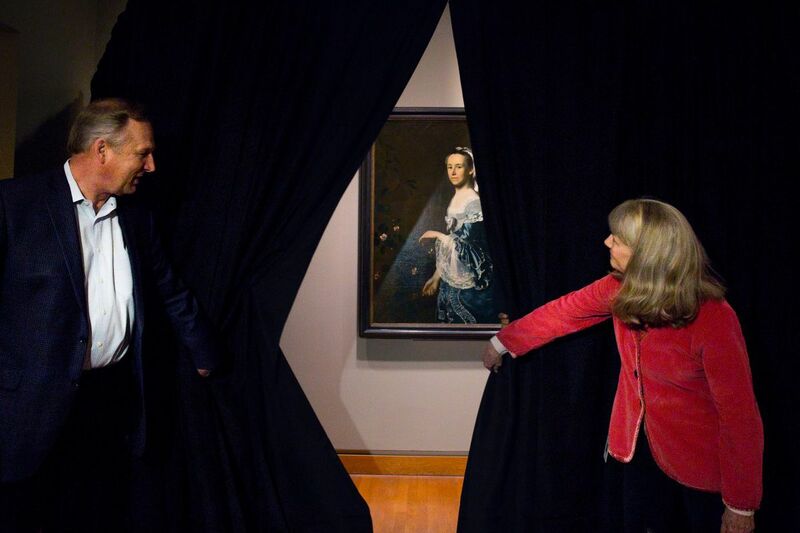 Timothy Rub, Director and CEO of the Philadelphia Museum of Art, left, and Kathleen Foster, Curator of American Art, right, unveil the painting "Mrs. James Warren (Mercy Otis)" by John Singleton Copley, the Philadelphia Museum of Art "won" the painting from the Boston Museum of Fine Art in a Super Bowl bet, in Philadelphia, Friday, March 9, 2018. A portrait of one of America's great patriots arrived at the Philadelphia Museum of Art this week, thanks to a Super Bowl bet between the museum and Boston's Museum of Fine Arts. John Singleton Copley's Mrs. James Warren (Mercy Otis) was unveiled Friday morning in the museum's American Galleries. It will be on display until June 3. After the Eagles defeated the New England Patriots, 41-33, in the Super Bowl, Timothy Rub, director and CEO of the Art Museum, received an email from Matthew Teitelbaum, director of the Museum of Fine Arts, that said, "OK, OK. I bow down." Teitelbaum was referring to the friendly wager between the museums. If the Patriots won, the Art Museum was to lend the Museum of Fine Arts Benjamin West's Benjamin Franklin Drawing Electricity From the Sky, and if the Eagles won, Copley's portrait of Mercy Otis Warren would be making the journey from Boston. "Boston nominated the painting after we asked for a true patriot," Rub said Friday. "Events like the Super Bowl bring the city together, and we're proud to be a part of that. Besides, it's fun to do a little trash talking." The Art Museum added to the good juju pre-Super Bowl by hanging an Eagles banner outside the famed front facade and by having the staff, decked in Eagles gear, sing the Eagles fight song. JESSICA GRIFFIN / Staff Photographer . Timothy Rub, director and CEO of the Philadelphia Museum of Art, and Kathleen Foster, curator of American Art, unveil “Mrs. James Warren (Mercy Otis)” by John Singleton Copley. This is one of many Super Bowl bets made during the Eagles' run, including a wager between each city's zoo — Zoo New England will have to name a new baby goat Foles, after quarterback Nick Foles — and another in which Boston's Old North Church will fly Betsy Ross' 13-star flag. Mercy Otis Warren is best known for publishing plays and poems that attacked royal authority anonymously and being an adviser to many important Revolutionary figures such as George Washington, John Adams, Thomas Jefferson, and Patrick Henry. Thanks to the Eagles, her portrait, which Copley painted when he was 25, is on display just 20 feet away from West's portrait of Franklin. The museum has two other Copley paintings on display in the American Galleries. "I'm sure Otis knew Franklin, so it's great that they're side by side," Kathleen Foster, the senior curator of American art, said. Foster said the museum decided to display the portrait in a gallery filled with other 18th century portraits and furniture because it wanted people to find it right away. "It's truly a treat to have a painting by one of the best Boston painters here," she said. "It's also so nice that she came during Women's History Month, because she's such a role model for us. I like to think of her as the Tina Fey of her day."